Romantic Getaways - Dining in Washington D.C. Romantic Getaways - Dining in Washington D.C.
Can two very different worlds coexist within the same city? If that city is Washington, D.C., the answer is yes – especially when it comes to DC’s amazing culinary offerings. Elegant, centuries-old hotels and restaurants grace the streets alongside up-and-coming, uber-hip eateries – and so many of them are places you shouldn’t miss on your next trip to DC. Here, a few of my favorites. Whether you’re staying there or not, a drink or dinner in the Venetian Room at the Lombardy is a must (dinner is served from 5:30-9:30 daily, and the bar is open from 5:30-midnight). Brushed velvet tapestry pillows and silk wall hangings decorate booths and walls, while tasseled valances festoon heavy drapes. Sink back into plush green and red patterned velvet sofas and sip a cocktail; you’ll feel like you’re in a scene from “Casablanca.” Wall sconces and tiny lamps filter just enough light into the cozy, low-ceilinged room, and the hearth against the far wall adds to the intimate ambience. If you’re staying at the Lombardy, know that you won’t find any newfangled accoutrements here; no high-speed internet, jacuzzis, or spas. But you will find a refined, aristocratic sense of elegance that’s missing from many newer hotels. A former apartment house in its past life, today it’s an upscale hotel decorated with Asian flourishes, but its manual elevator and brass mailboxes help it retain the flavor of an era gone by. Rooms are simple and spacious, and most of them have kitchenettes, so staying here feels very much like staying in your own 1940s apartment. Insiders know to request their breakfast in the Venetian Room — but be careful, you might want to spend the entire day there. Everything about the Henley Park Hotel is old — including the plumbing — except its incredible restaurant, Coeur de Lion (“heart of the lion” in French). 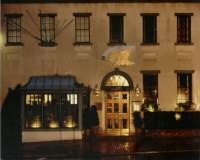 “Old-world elegance” certainly isn’t synonymous with “dingy” at this romantic favorite, truly the heart of old Washington, D.C. Comprised of two rooms, one with just eight or nine tables each, it’s a tiny, exquisite gem, so much more than you’d ever expect from a hotel restaurant. You’ll be greeted by the uber-dramatic maitre-diva Ralph, and after you get to your table (hopefully in the small round atrium), gaze up at the skylight above. When it’s time to order, go right for the lamb, guaranteed to make you swoon. It’s so tender, succulent and soft, Ralph encourages you to eat it with your hands. Let’s put it this way; it’s so seductive, I watched as a man proposed to his soon-to-be fiancee in the corner banquette. And you thought it only happened in the movies! Whatever you do, don’t miss 1789 Restaurant in Georgetown, which epitomizes fine dining. Named for an especially historic year in D.C., it must look very much like it did over two centuries ago. (Except that the food is so unbelievable, it could only have gotten better!) Dining here turns an ordinary day into a special occasion: your food is served on Limoges china and crystal; women dress to impress and men wear jackets (or the maitre’d will give you one). All the rooms are impeccably decorated and very romantic, but the Manassas Room is my favorite; it’s a cozy room with red banquettes and a huge antique pig scalder (resembling a large copper kettle) hanging from the ceiling like a chandelier. The walls are covered with siding from a 1860s Maryland barn, and dotted with prints of the Civil War. God is truly in the details here; brass pigeon lamps with handmade silk lampshades adorn the tables, while the cover of the menu features distinctly American art and changes frequently. I had an incredible salad of ruby- red grapefruit with macadamia nuts and gorgonzola cheese. The mussels appetizer was outstanding, too; Prince Edward Island mussels steaming in a Thai-style spicy coconut broth. All the entrees are great, but I recommend the Muscovy duck, similar to duck l’orange; it’s served with a Toigo honey ginger glaze, Anna potatoes, wild mushrooms, and roasted pears. The superbly professional staff will do everything in their power to make your meal — and your entire experience here — a work of art. 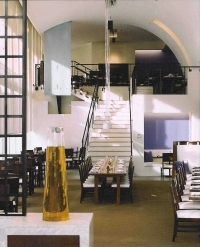 If you’re looking to enjoy top-notch cuisine in an atmosphere that encourages relaxing and loosening your tie, eat at 15ria Restaurant at the Washington Terrace Hotel. Here you’ll find upscale yet unpretentious comfort food with a focus on fresh, local ingredients at surprisingly reasonable prices. Copper, persimmon and eggplant dominate the decor, and make for a warm, friendly ambience — as does the granite hearth, where there’s always a fire blazing. But you’ll want to start out at the bar with a specialty cocktail, like a Mini Manhattan or Tiny Tini, or sample one of the selections on the most extensive bourbon list in D.C. And while you’re sipping, order some nibbles from the Social Food Menu; these are appetizers that are perfect for sharing, like mini sirloin burgers (with homemade ketchup!) fried buttermilk Vidalia onion rings, and grilled portobello mushroom with brie. By now, your appetite will be whetted and you’ll be ready to dive into the entrees: I loved the blue cheese crusted sirloin and the truffle oil infused potatoes. Or sink your teeth into molasses-braised short ribs or grilled baby lamb chops. And don’t forget the wine; the list complements the straightforward menu, and with prices from 19 to 120, there’s something for every budget. When I left, I was relaxed, happy – and still had money in my wallet! Zola has been called DC’s hottest restaurant, and after seeing it for myself, I agree completely. Attached to the Spy Museum, its aura is, appropriately, one of mystery and intrigue. And it’s really beckoning the beautiful people, who pack into its several small dining rooms for a taste of chef Frank Morales’s new American cuisine at impressively reasonable prices. Do your best to snag one of the red velvet booths with portholes, giving you a view of the kitchen (and giving the kitchen a view of you, so staff and chefs can keep a watchful eye on you). Or, if privacy is what you’re after, there are two half-moon booth hidden in the back beyond the bar. And the service is wonderful; order the eponymous drink, and two waiters arrive to prepare it for you tableside. Other selections on the amazing cocktail list might be served in similarly sultry way, and poured into a champagne flute of French crystal. Stop by for dinner this time of year and appetizers might include tuna tartar with a spicy lime vinaigrette, cucumber salad, whipped lemon cream and giant taro chips, or crisp rock shrimp on honeyed cornbread with a sweet pepper marmalade. Entrees are classic and delicious, and could include seared Columbia River king salmon with stirfried peas, wild ramps and tarragon. For dessert, the choice is obvious: the super-decadent fondue served with a flourish and surrounded by Rice Krispy treats, peanut butter cookie dough, fresh strawberries and bananas. Remember, if you happen to drop a piece of fondue on the table or floor, you have to kiss your dining companion: but don’t forget that the chef is probably watching, and the secretary of state might be eating a the next table! You’ve had tapas, but what about tapas Turkish style? No? Then visit Zaytinya, another DC hotspot, and the latest eatery in chef/owner Jose Andres’s empire.. It’s the place for incredible finger food, or meze, with Greek, Turkish and Lebanese flair — priced for sharing . The massive 200-seat establishment still feels cozy ; chalk it up to the huge grid of candles, and the gentle blue and white walls. Ask the waiter to help you select a wine from a long, balanced list; you won’t find these Middle Eastern wines in most restaurants. Vegetarians will love the perfectly-done falafel and the yummy kolokithokeftedes, or zucchini-cheese patties, while carnivores will salivate over arayes (minced lamb in a pita) or kibbeh (beef and wheat fritters with almonds, pinenuts, and currents). And don’t miss the incredible baklava for dessert. It’s easy to eat your way through both old and new D.C. — and these are just a few of my favorites! But don’t take my word for it; taste it for yourself.